Catena Encke (an unofficial name from D.Caes for a small chain of depressions south-southwest of Encke). Dorsum Milichius K (an unofficial name from D.Caes for the wrinkle ridge southeast of the bowl-shaped crater Milichius K). Encke's Triplet (an unofficial name from D.Caes for the curious row of three craterlets east of Encke, see description below). Garsioli (Van Langren's disallowed name for Kepler Theta). Hortensius (and the Schlumberger domefield north of it) (Van Langren's Gualteri) (?) (E.A.Whitaker seems to be uncertain about that one). Insula Anemusa (J.Hewelcke's disallowed name for a bright spot north of Lansberg). Insula Cercinna (J.Hewelcke's disallowed name for the outer bright nimbus of Kepler). Insula Menyx (J.Hewelcke's disallowed name for the bright area at Kunowsky). Insula Ventorum (Riccioli's disallowed name for the high albedo area of ejecta-rays around Kepler) (but wait a minute... so it is depicted on Grimaldi's map (the one with Riccioli's nomenclature), while on the moonmap made by the Dutch moonobserver A.J.M.Wanders in his moonbook Op Ontdekking in het Maanland (1949) it is depicted around... Copernicus) (did Wanders mentioned the reason of this change in his book?). Insulae Taraciniae (J.Hewelcke's disallowed name for the nimbus of Hortensius and bright spot to the west of it). 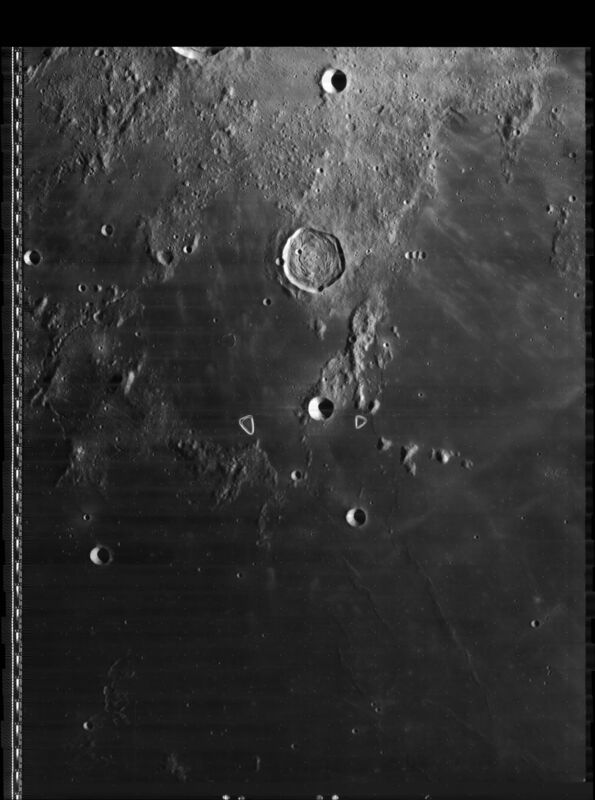 Kepler (Van Langren's Thomae D. Sab.). Kepler Omega (hill immediately north-northwest of Kepler) (see SLC E4) (System of Lunar Craters, 1966). Lansberg (a very tiny little bit of the northwestern part of this crater's rim is seen at the lower right corner of Chart 30). Laucii (Van Langren's disallowed name for Kepler Gamma). Loca Paludosa (J.Hewelcke's disallowed name for the inner nimbus of Kepler). Milichius Pi (the once official name for the prominent dome immediately west of Milichius) (see page Milichius for photographs of Milichius Pi). Quesada (Van Langren's disallowed name for Milichius Gamma, see page 199 of E.A.Whitaker's Mapping and Naming the Moon). Schlumberger domes (an informal name for the domefield north of Hortensius). Sinus Syrticus (J.Hewelcke's disallowed name for the low-albedo area southwest of Encke) (Encke T). This page was last edited on 22 April 2018, at 18:00.